Chiles and limes just belong together, somehow, and this simple dish is a perfect expression of that harmony. 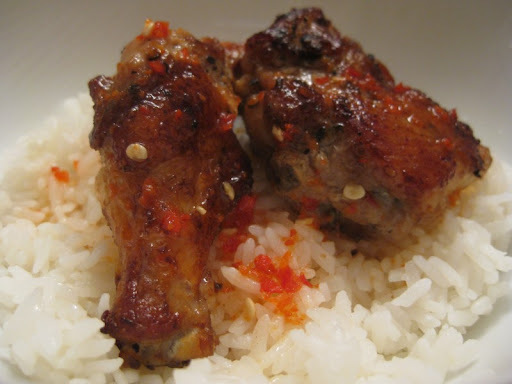 We call it Chile-Lime Chicken, but it is based on a recipe from British restaurateur and television chef Nancy Lam. She calls her dish "Mummy Saucy Chicken" because, as she says "it and stir-fried vegetables were the only things that my mother ever cooked for us, when she wasn't gambling". If this dish represents childhood neglect, well then sign me up! It really is easy to make. Take your favorite cleaver (you do have a favorite cleaver, don't you?) and hack up a chicken into small pieces. After several hours in a soy-based marinade (we usually mix it up in the morning for dinner that night), fry 'em up. The marinade gives them a fantastic golden color. 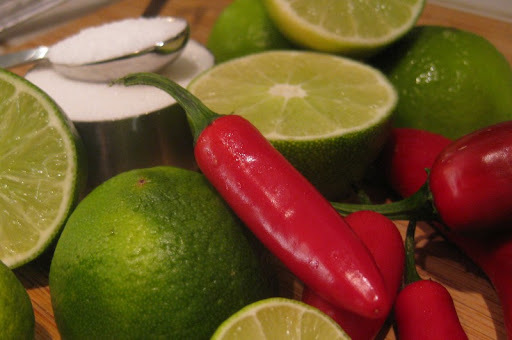 Make a simple sauce of chile, lime juice and a bit of sugar. Use whatever kind of fleshy, red chiles you can find. We've used red serranos, red jalapeños, and (when we can get them) the red Holland chiles that are commonly used in Indonesian cooking. The heat level will vary wildly depending on your chiles and how much of the hotter inside bits you use. We like it pretty hot. The fiery, tangy sauce pairs perfectly with the salty, savory chicken. We serve the chicken family style with individual bowls of the sauce for dipping and bowls of sticky rice to help absorb the chile-burn. 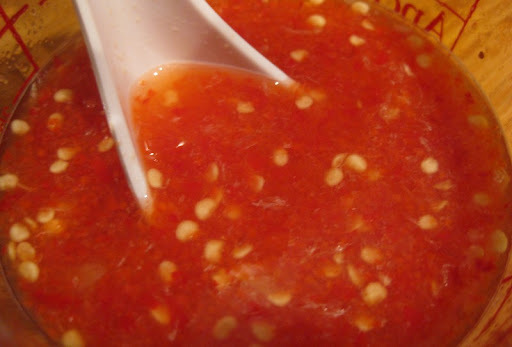 The sauce is also good for other things - a dipping sauce for potstickers, adding some kick to an Asian slaw, on Banh Mi, etc. If you can only find a 5 pound or larger bird, remove one of the breasts and save for another use. 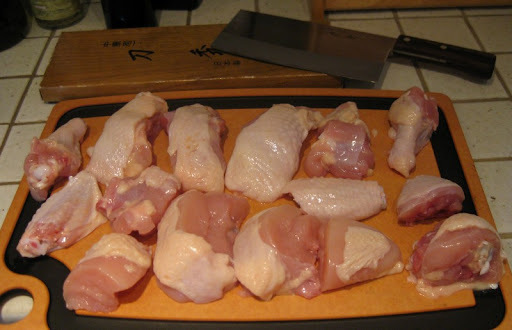 Use a cleaver, kitchen shears or heavy knife to cut the chicken into small pieces (ie: breasts in 4-5 pieces each, wings split, thighs and legs in half). Leave the skin on. 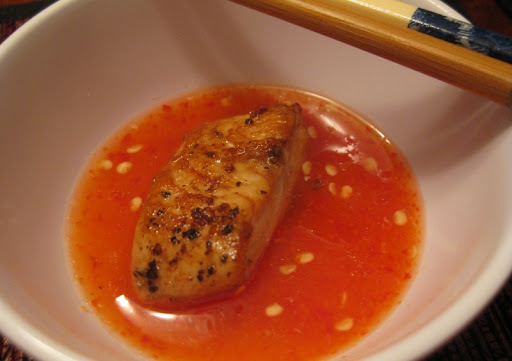 In a large bowl, mix 1 ½ teaspoon salt, the soy and the black pepper. Coat the chicken pieces evenly in the mixture and refrigerate for at least 4 hours (you can do this in the morning, and let it marinate all day in the fridge). Squeeze the juice from the limes -- you should get 2/3 to 3/4 cups juice. Chop the chiles into smallish pieces. Put the chiles, a teaspoon of salt, and the sugar into the lime juice, then use a hand blender or food processor to chop the chiles finely. Taste the sauce and add additional sugar or salt if needed. Heat the oil to medium high in a fry pan. 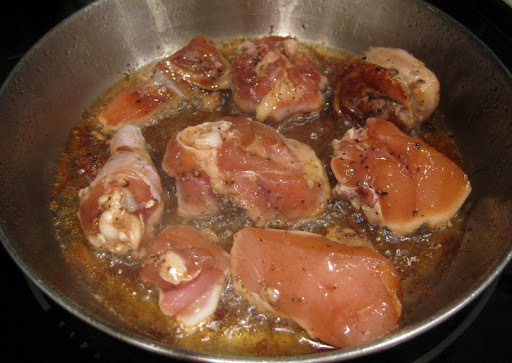 Without crowding, place the chicken pieces into the pan and fry until golden brown and cooked through, turning as needed (15-20 minutes). Remove cooked pieces and keep warm while cooking the rest. Serve the chicken family-style and provide each diner with a small bowl of dipping sauce and a second bowl of plain short-grained rice. 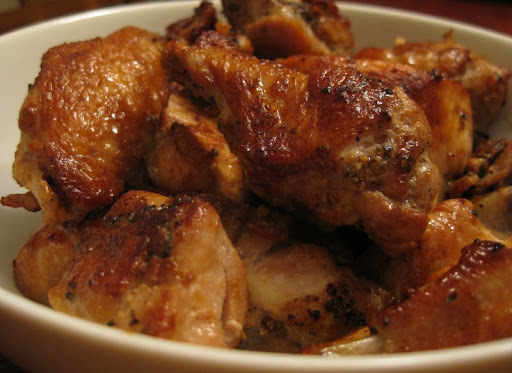 There's something about these type of chicken dishes....it's that "I just can't stop eating" syndrome! Nice recipe, thanks for sharing. Hi Kirk - yep, definitely very addictive flavors. I made this dish yesterday for a group of frieds who said they weren't that hungry. In less than 10 minutes, the plate was licked clean. You should have seen the way these barbarians I call friends attacked this chicken -- not a shred of dignity left. Thanks for the recipe, you guys. The next one I want to try would be the bahn mi pork thing. It's been calling my name. Hi Leela - glad your friends enjoyed the chicken!